Lots of food to discuss today for What I Ate Wednesday! I had my usual pre-run small bowl of oatmeal with banana early in the morning. After my run, I wanted a slice of cinnamon raisin Ezekiel bread with peanut butter and jelly. Trader Joe’s was out of the organic crunchy salted peanut butter last week. Instead of throwing a fit, I just bought a jar of creamy peanut butter for the first time in a long time. I think I like it! 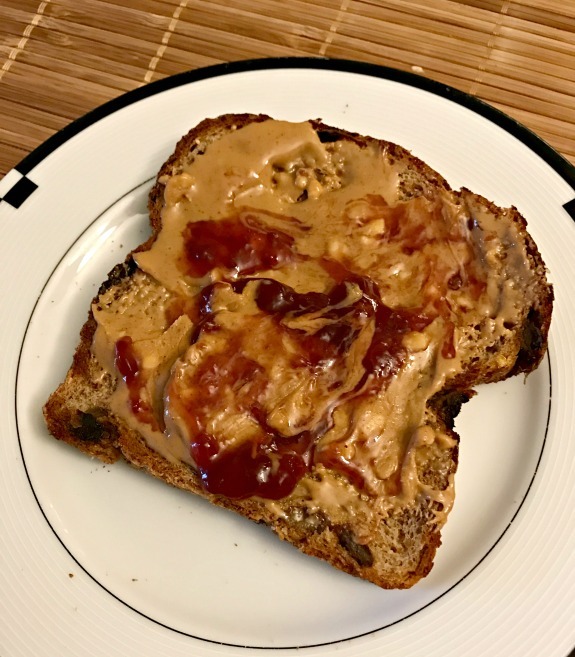 I’ve been on a crunchy peanut butter kick for about ten years now so this is totally different for me! I mixed the two peanut butters together on my toast. It was a nice combination. 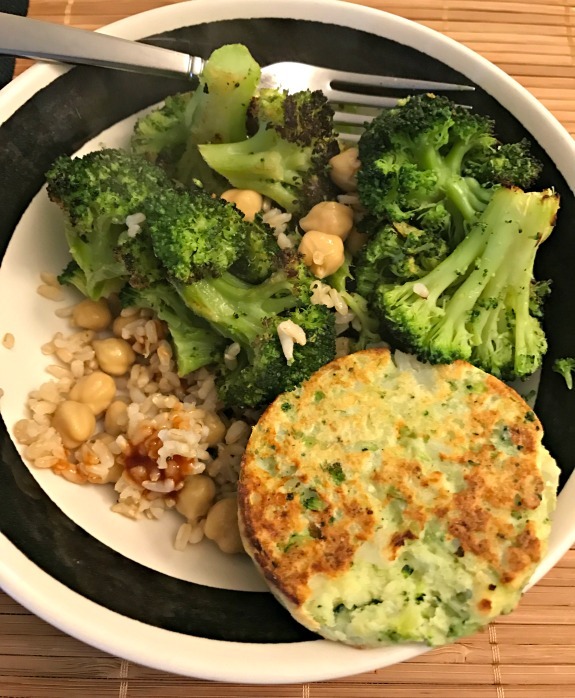 Lunch was made out of leftover brown rice along with roasted broccoli, chick peas and one of the new broccoli & cauliflower vegetable patties from Trader Joe’s. I liked this vegetable patty much more this time around because I let it cook longer which made it crispy. It needs to be crispy in order to be good! I didn’t get a picture of my son’s plate but he tried the carrots & peas vegetable patty. At first he wouldn’t admit it so he said it wasn’t good but then he ate the whole thing. When I asked again, he said it was okay which means he liked it. 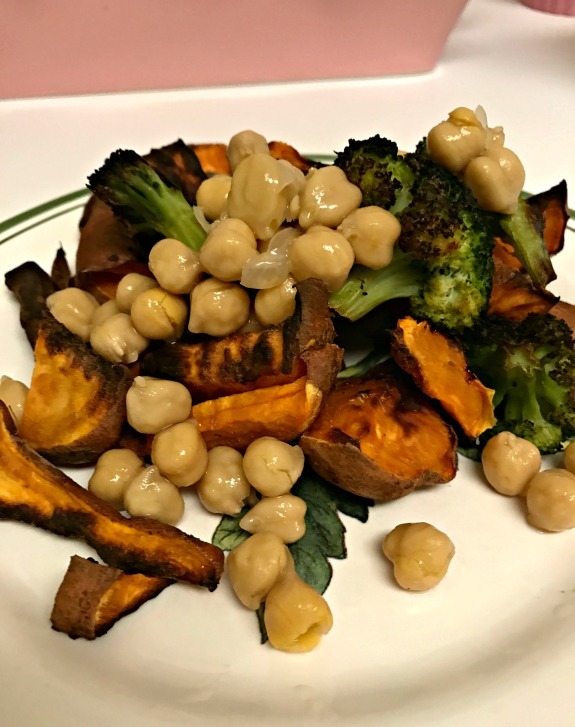 Dinner for me was the usual experience of not sure what I want so let’s throw everything together (roasted sweet potatoes, leftover chick peas, broccoli and avocado added after the picture). I eat a lot of broccoli in case you noticed not because I love broccoli but because I hardly buy a variety of vegetables anymore. It usually goes like this — Okay, Trader Joe’s has frozen broccoli this week? Let’s buy a few bags and call it a day. 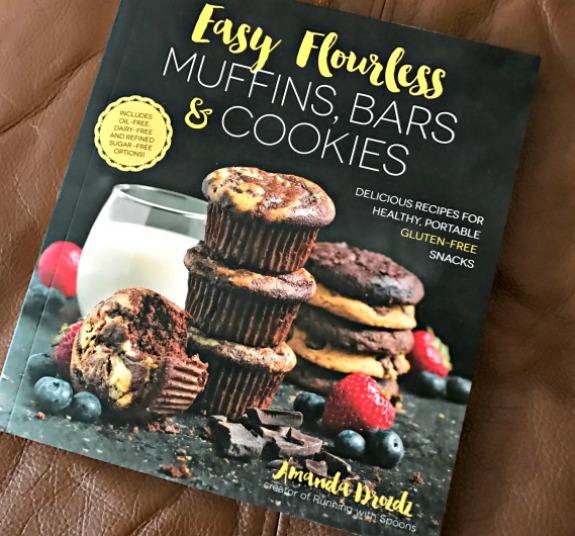 You may have seen on Instagram that I have been all excited about Amanda‘s new cookbook, Easy Flourless Muffins, Bars & Cookies! I am super proud of Amanda for working so hard to make this cookbook happen. In some ways I feel extra close to this book as I was there to support her throughout the process. Even though we have yet to meet in person, Amanda is one of my closest of friends for over three years now! My son and I couldn’t wait to try her recipes and of course, we went with the chocolate chip cookies first. These simple chocolate chip cookies, which are flourless and gluten-free, are amazing. We could not stop eating these cookies when they came out of the oven. Like really, I had to take the plate away from both of us. Amanda’s recipe for these chocolate chip cookies fascinated me a bit. I could not get over how spot on the texture was and how they puffed up so pretty without the flour. Although they contain nut butter, I wouldn’t even classify them as tasting like a peanut butter cookie. I used peanut butter in place of the almond butter. I highly recommend Amanda’s new cookbook for so many reasons (the pictures are amazing and the pages flip so nicely) but mainly because I like having an actual book of recipes in my hands over just reading recipes online. It’s fun to whip out the cookbook to browse and see which recipes spark your interest and then have the recipe right in front of you without the need to look at technology. I don’t know, that’s just how I always liked to bake. * I was not asked to review Amanda’s new cookbook and all opinions/recommendations are my own. Which type of nut butter do you like best? Crunchy or creamy? Do you still like to use an actual cookbook in the kitchen? Which vegetables do you buy the most when you go food shopping? My top two veggies are broccoli and spinach. I have always loved broccoli since I was a little kid! I tend to go with creamy PB but sometimes getting crunchy is a nice change. I need to get Amanda’s cookbook! I have been using Run Fast Eat Slow but other than that most of the recipes I follow are online. I really love her recipes in this book! all of them are easy with ingredients I have on hand. My top veggies are parsnips, beets, and bell peppers. It’s been a long time since I’ve had broccoli! Those cookies look delicious! I usually use online recipes but I enjoy reading the physical copies of cookbooks. Great day of eats! Broccoli is one of my fav. green veggies and I eat a ton of it as well. Im a creamy pb man, and I prefer flavored, and I do still use old fashioned cookbooks. I love my old fashioned cookbooks, especially my cookie cookbooks! you two are my favorite Canadians! I ordered her cookbook too! I have made at least 5 recipes already…so good! My boyfriend who eats anything and everything loves the treats I’ve made too! I’m not picky when it comes to nut butter, other than the fact that I don’t like Nutella. I’m surprised that I’m not orange yet because I buy and eat yams almost on the daily. I buy like 65 ounce or something crazy bags of frozen broccoli. My greatist discovery was throwing frozen broccoli straight to the oven for roasting. Mind blown how well it turns out. Better than fresh in my opinion. I am a sucker for a physical cookbook myself. I save recipes from online but I find I don’t really make them as much as when I have a book in front of me. My most popular post actually is my recipe for how to roast frozen broccoli. How funny! It’s the best and so easy! ha!maybe you did! I wrote it 2 years ago and every day it’s my top viewed post. I didn’t plan that to happen! 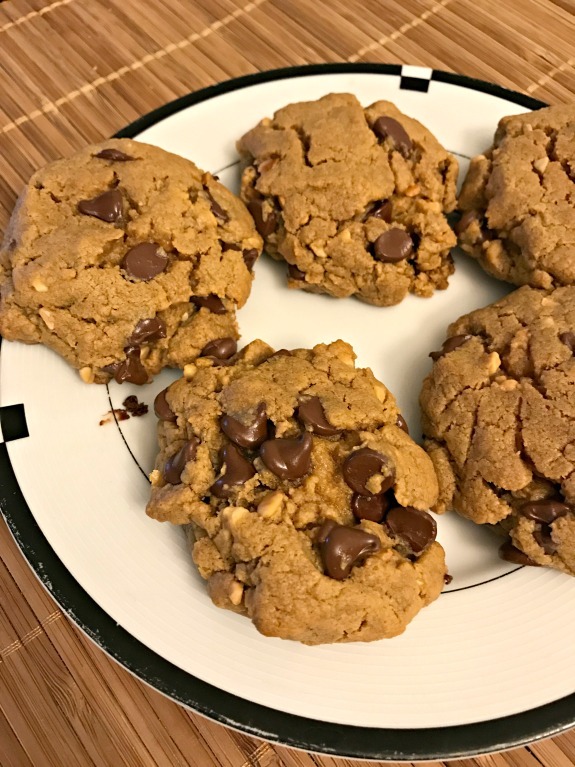 these cookies were so soft and chewy, even the next day after my son left them out uncovered! !